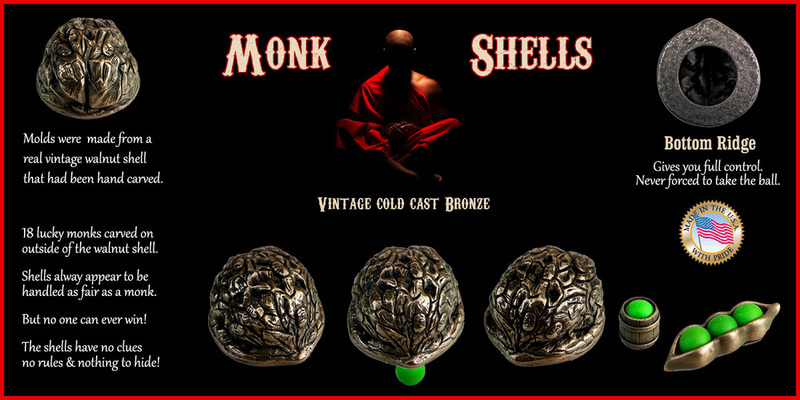 The shell molds were made from a very expensive antique collectible hand carved walnut shell from China. 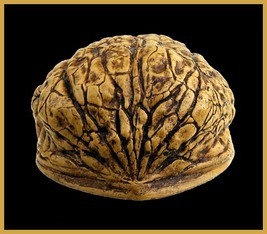 The outside of the walnut shell has carvings of 18 monks that represent a lot of different meanings dealing with luck. The original carved shell that the mold was made from dates back to the early 1900's. The inside is also of the natural shape. So we made some molds just like the original antique walnut, but extending a bottom ridge to make it a one of a kind Bottom Ridge Shell. The bottom is also textured to add to a more natural vintage looking shell. These shells are not only beautiful, they are one of the best handling shells you will find. The inside of the shell is all natural without any putty to bring lots of room inside the shell to work with a larger 7/16" pea to roll freely inside the shell. 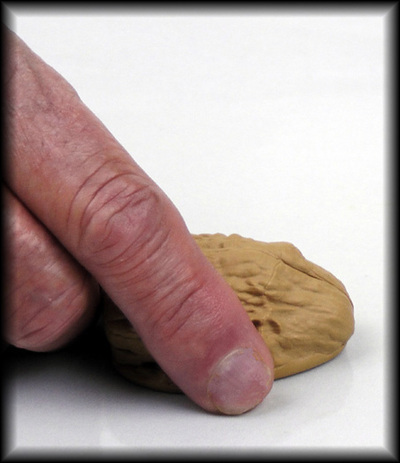 The soft pea is a very easy pea to finger clip. These soft type peas will bring easy control in or out of the shells. This set being displayed will be remembered for beauty and amazement. A shell set with no clues, no rules and nothing to hide. This can be a nice ending surprise for the spectator. ​The kicker is brought in by switching out a regular shell when turning the shells back over to start a new series of play of the game. After the shells are all turned over the tip of the kicker is placed on top of the ball, where the ball can still be seen. You get the shell carry tube that is out of the play area and get rid of the palmed regular shell from the switch out at the same time. The tube is placed over the shell and ball. All is moved over to the player and told to place their finger on top so the ball has no escape. The other two shells are picked up, shown that they are both empty and placed back down on the surface. You try to talk the player into picking another shell rather than the one their finger is on. It doesn't matter if they change their pick, as none of the shells have the ball under them at this point. Normally they will keep with the one they hold. When they take the tube off and lift the shell there is no ball. 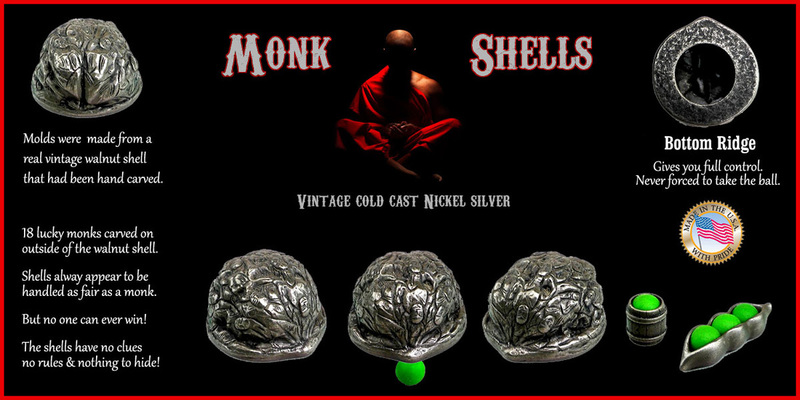 When they turn over the shell to look inside the shell, they will be surprised to now find it is now a solid shell with a bronze image of three Monks. 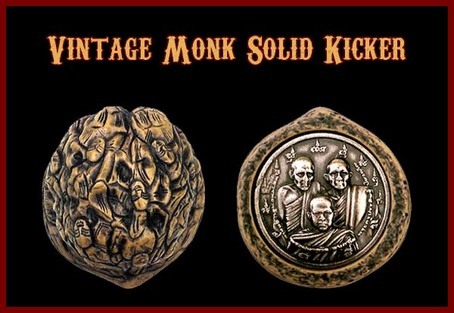 "It looks like the Monks took the ball in blessing you with some good fortune to come." The kicker can now be shaken and they will feel the ball inside the kicker when the kicker is shaken. ​ Everything ends on a positive note and everything can be fully examined. This shell set is so beautiful that they most likely will want to look at them up close. The inside is also of the natural shape. So we made some molds just like the original antique walnut, but extending a bottom ridge to make it a one of a kind Bottom Ridge Shell. Black dye is applied to the shells to bring out the detail and the vintage look. The bottom is also textured to add to a more natural vintage looking shell. These shells are not only beautiful, they are one of the best handling shells you will find. The inside of the shell is all natural without any putty to bring lots of room inside the shell for a larger 7/16" pea to roll freely inside the shell. The soft pea is a very easy pea to finger clip. These soft type peas will bring easy control in or out of the shells. This set being displayed will be remembered for beauty and amazement. A shell set with no clues, no rules and nothing to hide. 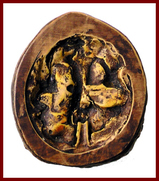 When they turn over the shell to look inside the shell, they will be surprised to now find it is now a solid shell with a bronze image of three Monks. 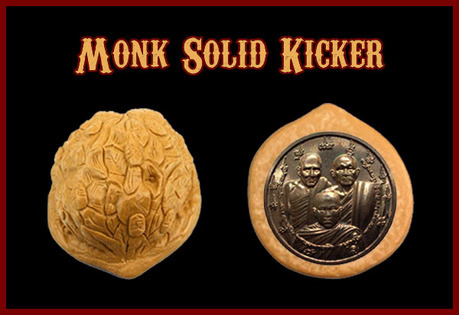 "It looks like the Monks took the ball in blessing you with good fortune to come." 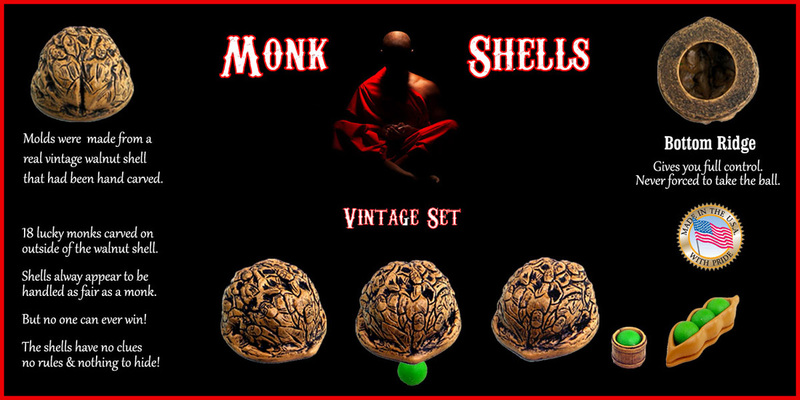 ​The shell molds were made from a very expensive antique collectible hand carved walnut shell from China. 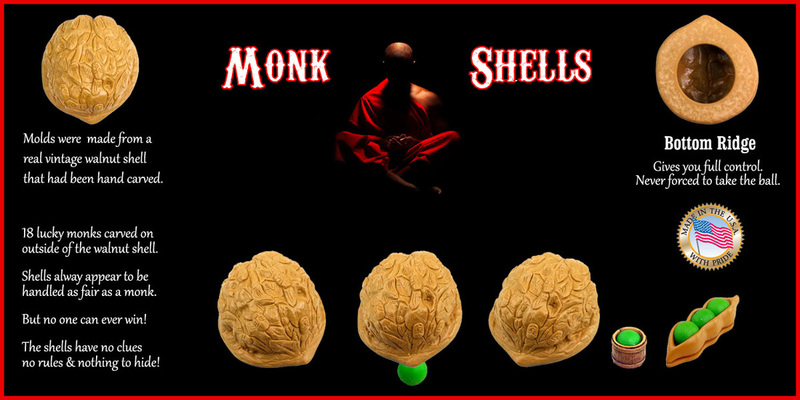 The outside of the walnut shell has carvings of 18 monks that represent a lot of different meanings dealing with luck. The original carved shell that the mold was made from dates back to the early 1900's. The Mystery Shell Set is not a trickery gimmick set of shells. The Mystery is how the magician uses them. 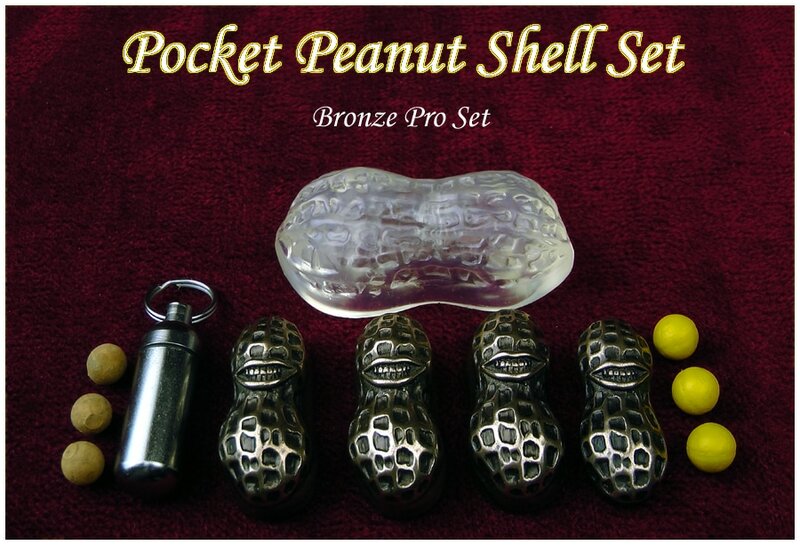 This is a set that is open to display the shell game in any way you want to use them, without any visual gimmicks. All the shells we make have no visual notch at the back of the shell or the use of a gimmick that makes a rocking horse shell to steal the pea. These visual gimmicks are not needed because of the shell interior design and the type balls that are used with the shells that have an entirely flat surface. ﻿Shell Interior: ﻿ the inside of this shell has lots of head space, the inside is 3/4" high in all areas inside the shell. The ball is able to roll freely anywhere inside the shell. You will never have any movement of the shell when you take your hand away from the shell that has a pea, as the pea will never touch the top of the shell. You are also able to use larger balls if you like. The shell only has a taper where it is needed, on the inside and outside of the bottom edges of the shell wall. This interior design brings the feature to also use a cork ball, the way the three shell game was original display. When the shells are used with a cork ball it gives you full control to sell the con on your own. The cork ball stays inside the shell till you want to steal it. Everything can be fully examined at any time and appears that the player has a fair chance at winning. This is a shell set your game can grow with. ﻿Shell Size: ﻿the shell molds were made from a real walnut shell that comes from a rare tree that produces unique large walnuts. 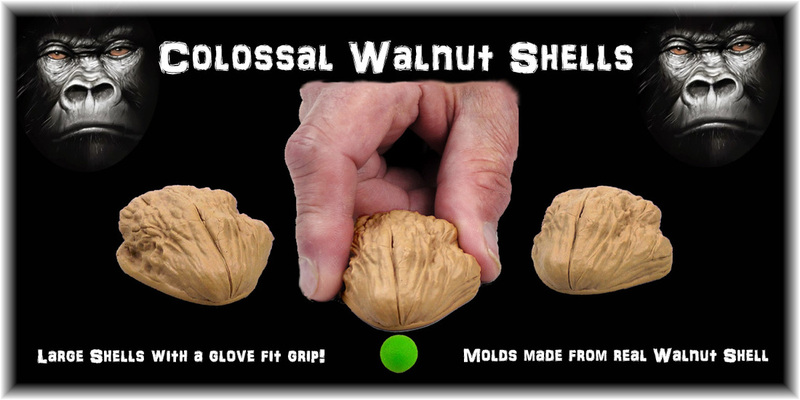 Many think large walnuts are easier to handle for the shell game, this is true if you are looking at the right balance of measurements. It is not just the length of the shell, as this just means you had to move the shell a longer distance before you can steal the pea. The height is more important. Having good height makes the shell easier to pick up and handle. A good example of this is a black walnut shell. This is a smaller type walnut but has good height and a rough texture where the shell handles well. 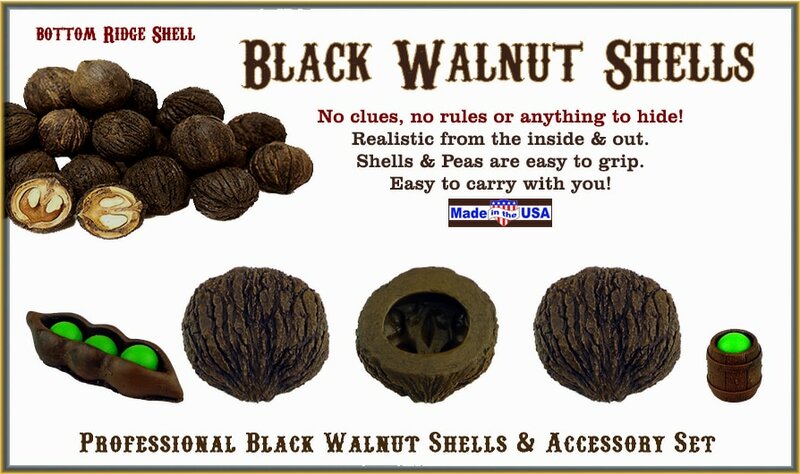 Like our Rough & Ready black walnut shells. Good height to a shell also brings better interior space inside the shell. This shell is 1-3/4" L x 7/8" H x 1-1/2" W. This is a very good working balance on the measurements for a large shell. ﻿Shell Shape: ﻿the shells have a good uniform shape with a smooth rounded point on the front of the shell. A sharp pointy shell will not handle as well as the non-pointed shell. The non-pointed shell will not dig into the mat when moved on the surface and will fit much better inside a shell trap. There is less movement of the shell when the trap is move with the pea inside the shell. Shell Texture: has a beautiful nature texture that makes the shells easy to grip for easy shell handling. ﻿Shell Appearance:﻿ these shells not only have good working features, they are very natural looking. The shells have the vintage look to show off the beauty of the natural grain of the shell and the large size of them brings a great display. Shell Quality: All of the shell castings are made under high pressure to have bubble free quality shells. 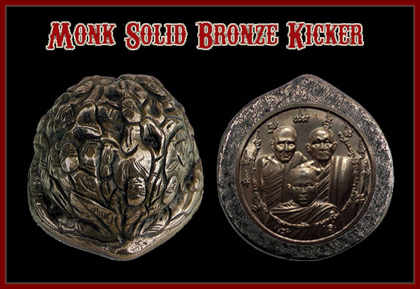 All three shells and solid kicker are made from the same color mixture of resin and all poured to cast at the same time. This brings a perfect color match to all four of them. Soft Peas: the peas work on a hard or soft surface and the soft pea brings a smoother steal with a shell that has an entirely flat surface. 2 - Natural Cork Balls 5/16 & 3/8"
Shells 1-7/8” L X 1-5/8” W X 7/8” H Weight is 15 grams per shell- shells can work with cork ball or soft pea. This set comes with many features of high-quality items, to bring your game to a higher level of entertainment. These shells are not like other shells. They have no gimmicks and bring more features. As you can see from the above #1 and #2 pictures, the shell has an entirely flat surface. 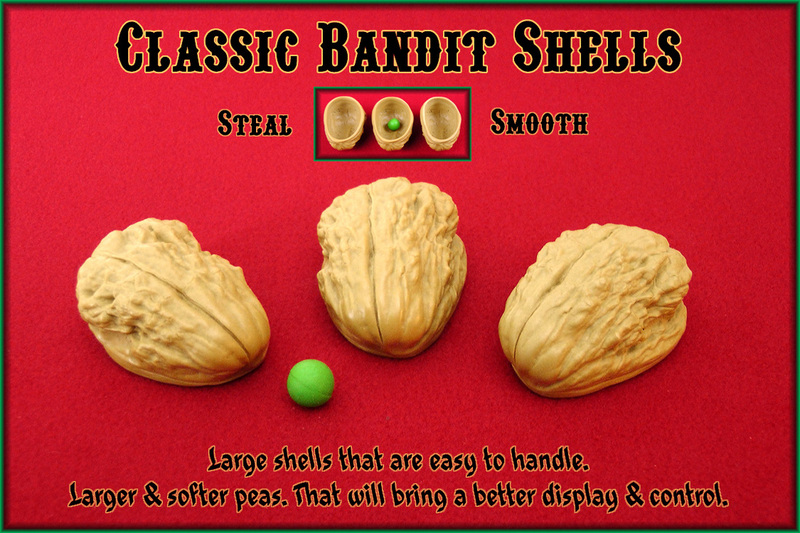 If the shell handling is used right, you don't need a visual hole or a rocking horse shell that many think is needed to steal the pea. Many think the V-notch opening at the back of the shell can be justified because the hole on a real walnut shell is where it was attached to the stem. No matter how anyone tries to justify it, it is still a visual hole for the pea to escape the shell. Man made shells were not picked off a stem on a tree. You are only fooling yourself. 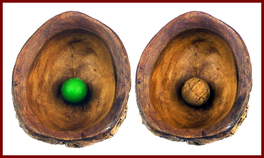 The above image #3 and #4 shows the shell interior with a cork ball and a soft pea. The shell interior was designed to work with both types of balls. When the shells are used with the soft pea, the shells will work like the classic type shell. But without any visual gimmicks. When the shells are used with a cork ball; they work like the Bottom Ridge type shells. Where you have full control of the ball at all times. You are never forced to take the ball and everything can be fully examined at any time, without switching anything out. The inside of the shell has more head space than other shells made. This lets the ball roll freely in all areas of the shell. They are large shells that are very easy to pick up and handle. These are very solid made shells that will last a lifetime! The High Top Walnut Shells are large walnut shells that have good height for easy handling and can work with a larger peas. The set comes with the larger 3/8" peas. The shells can work with a larger 7/16" pea if you prefer. These shells are the same walnut shell as The Game Taker Shells. But this shell is a little higher in height with the added Bottom Ridge bottom. This unique shell brings many features that are hard to find in selecting a shell to look and handle this well for the shell game. Many think a larger shell is easier to handle than a smaller shell. This is true, but most are judging this on the wrong measurement. The length of the shell does not make it a better shell to handle if you don't have the height with it. The height is more important than the length. These shells are very easy to pick up because of the height. Also, the shell shape is important. The shape of this shell comes straight up without the low inward curve like most shells. Having the low inward curve on a shell is why the fingers will slip off other shells when picking the shell up. The inside height of the shell is also a key factor for the pea to roll freely. Having the straight upward shape on the shell wall the pea can roll anywhere inside the shell without any pressure on the pea. There is never any movement of a shell that has a pea, after releasing your grip on the shell no matter where the pea is in the shell. This is because the pea never touches the top of the shell anywhere inside the shell at any time. These are all key features in selecting a good working set of shells. 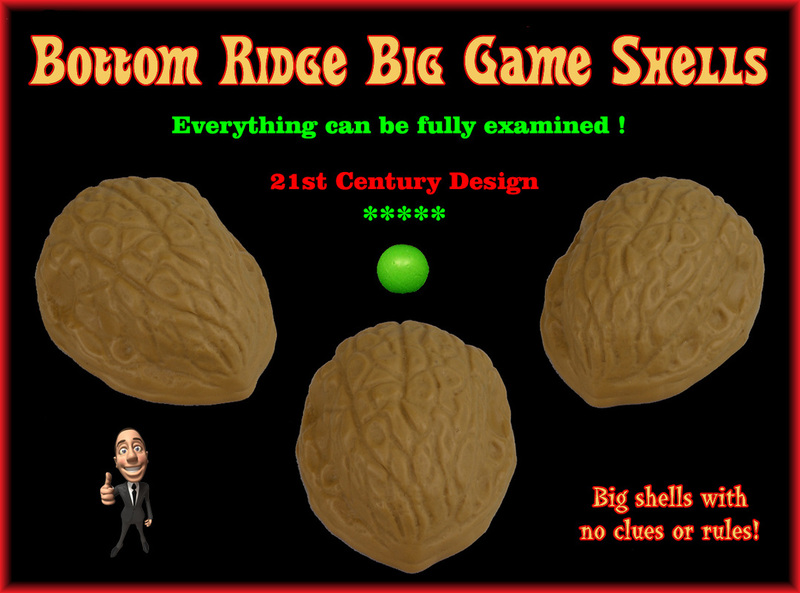 The added Bottom Ridge makes it a true con-shell on its own, without the use of added shill's to the game. Why is this? Because the bottom ridge makes it a fair game till you make it unfair. A con game is not a con game till the player has the confidence to play. With the bottom ridge shells, there are no clues or rules and nothing to hide that brings confidence to play. The bottom ridge is not a gimmick. It is just the opposite, as the ridge never hides the pea. The ridge just gives the pea a path to continue its travel inside the shell. This makes the shell and pea work like the player thinks it should work to be a fair game and it is. 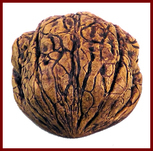 All real walnuts do have a lip on the shell rim to hold the nut in place. Everything can even be fully examined if need be. No switching of the soft pea out. The soft pea has a reason for being soft, so they don't hear which shell it is in, by the sound. 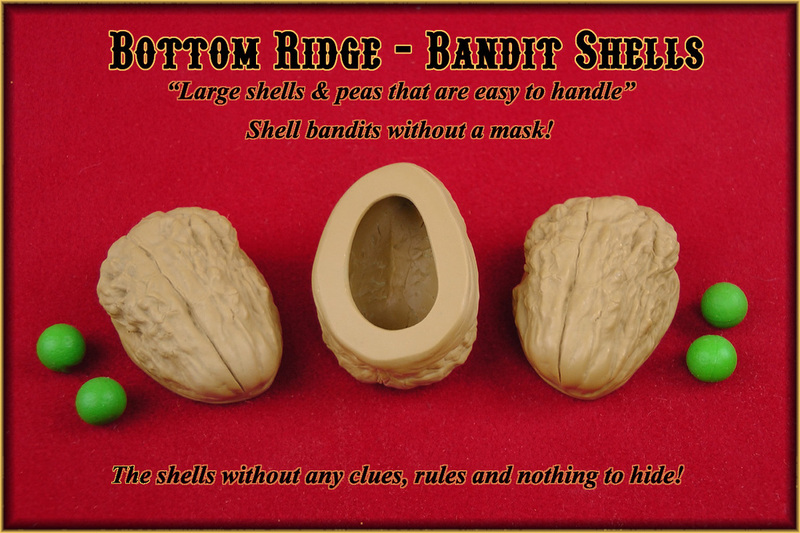 Unlike other shells, the ridge keeps the pea in the shells when moved in all direction, to make it a fair game. The shell has an entire flat surface. Gives you total freedom in doing steals and loads when you want to. You are never forced to take the pea at any time. The shuffling of the shells can be extended without having to take the pea in the hand or have to keep reloading and stealing it on every movement of the shell. This can bring the confidence to follow the correct shell that has the pea by lifting shells during the shuffle, to show the pea or the shells that don't have the pea. This not only gets them to follow the shell you want them to follow but cuts the steal and loading of the pea down to one time without having to hide the pea in the hand. This cuts down any chances of them seeing it, as you can pick the right time to execute everything. If you want to perform a more magical display the ridge can also hold a load in the shell when held up off the surface that will appear to be empty before placing the shell over the pea and give them a big surprise when the shell is lifted. Peas - The peas are the best handling soft peas you will find. They are much softer than others, this makes them easier to control and finger clip. Work on hard or soft surfaces. Comes with video instructions on the handling of the bottom ridge shells, the pea, pea loading, pea stealing and shell switching that is done right in front of the spectator. The High Top Walnut Shells are large walnut shells that have good height for easy handling and can work with a larger pea. The set comes with 3/8" peas but can work well with larger 7/16' peas. These larger peas are easy to handle and finger clip. As they are softer than other peas. These shells are the same walnut shell as The Game Taker Shells. But this shell is a little higher in height with the added Bottom Ridge bottom. The Top Shelf Walnut Shells molds were made from a real walnut shell. This unique shell brings many features that are hard to find in selecting a shell to look and handle this well for the shell game. Many think a larger shell is easier to handle than a smaller shell. This is true, but most are judging this on the wrong measurement. The length of the shell does not make it a better shell to handle if you don't have the height with it. The height is more important than the length. These shells are very easy to pick up because of the height. Also, the shell shape is important. The shape of this shell comes straight up without the low inward curve like most shells. Having the low inward curve on a shell is why the fingers will slip off other shells when picking the shell up. ﻿﻿Bottom Ridge shells - ﻿﻿Bottom Ridge Vintage shells﻿ - Bottom Ridge Ghost shells. Cork Ball -Soft Ball shells and Vintage Cork Ball -Soft Ball shells. This type shell has a bottom lip on the shells that makes them fair shells with a soft pea. This is a new 21st-century design for the shell game. These type shells are the only shells that do have a secret to how they work. You have full control of the soft pea at all times. You are never forced to take the pea. Everything can be fully examined at any time, without switching anything out. This brings confidences that the player does have a chance to win. The ridge is not a gimmick. It is just the opposite, as the ridge never hides the pea. The ridge just gives the pea a path to continue its travel inside the shell. This makes the shell and pea work like the player thinks it should work to be a fair game and it is. All real walnuts do have a lip on the shell rim to hold the nut in place. 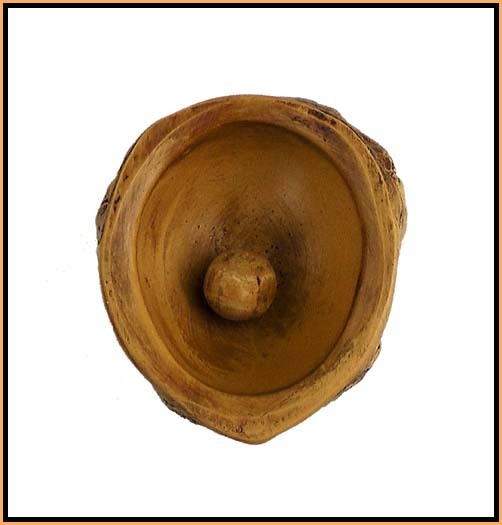 This type shell has entire flat bottom surface without any gimmick to make them work. At any time you choose you can change a fair game to an unfair game with fewer moves than other type shells. The shells without the clues, rules and nothing to hide! These type shells are the same shells as above. The only difference is they have stained coloring in the grain of the shells. This vintage look brings out the beauty of the grain. The bottom surface is roughed up some to bring the old vintage look. These type shells stand out with detail beauty and has all the same working features as the above shell. 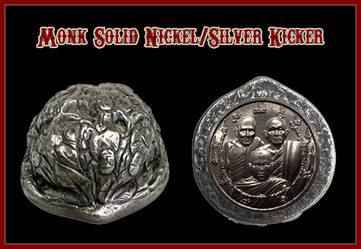 The Shake~Rattle & Roll "P" Kicker brings a double surprise right in the spectators hands that will surely be remembered! This kicker works with the Top Shelf Vintage shell set, that is switched in the game when turning the shells back over to begin the ending series of your routine that will deliver hands-on fun for anyone. There are a few different ways you can use this ending kicker. Here are a few. 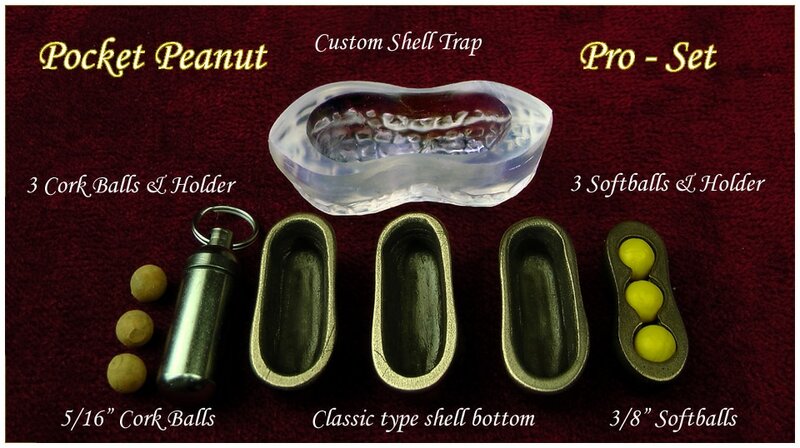 You can use it by itself or the ideal way with a shell trap, as shown below. The name of the game is to pick the shell that has the peas. To make it seem to be a sure winner. You put the shell on top of the pea and bring in the shell trap to trap the shell and pea in the trap. The pea can still be seen. The trap is moved over to the player to place their hand on the top so the pea cannot escape. Then the other two shells are picked up and shown they are empty. From here you can milk it any way you want and they can pick any shell they want, but it will always be wrong. Because the real pea is not under any of them. The First Surprise: When the player lifts up and turns over the shell the real pea is not there. There is a pea, but it is a green letter "P" engraved on the shell that appears to be a solid shell. So you give them another shot at finding the real pea, being they had been tricked. The Second Surprise: The player picks another shell. Thinking they now have a 50% chance of being right this time. The player turns up their pick and it is a wrong pick again. The last shell is turned up and the pea is not there either. So where is the real pea? You tell them; "The funny thing is you have had it all the time, you just couldn't see it. As it is hiding inside the shell. You have the player shake the shell and they will now feel the pea inside the shell and you end the game with being clean where everything can be examined. The Ghost Shells are one of our best entertaining set of shells we offer. The spectator is very involved in the game, hands on and very visual. The semi-transparent shells are used with a pearl colored ball that matches the shells. They blend together very well where the ball can be seen in the shell when the shell is in motion. Like a ghost image. When the shell comes to a stop, the ball cannot be seen. The ball is never where it was last seen unless you want it to be. What makes these shells so special over all other shells is the Bottom Ridge design on the shells. 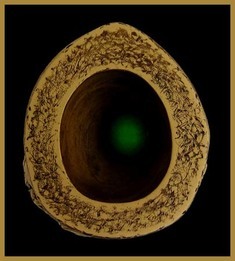 The bottom ridge keeps the ball in the shell, to prolong the visual experience of following the ball in the shell. The bottom ridge it, not a gimmick. It is just the opposite. The ridge brings the con for the player to believe they have a fair chance at winning. As everything appears to be fair and it is. But the game is only fair as long as you want it to be. At any time you choose you can change the game to be an unfair game. The beauty of this is you have full control of everything with no gimmicks and nothing to hide at any time. Everything can be fully examined without switching anything out. ﻿The ending surprise is a killer﻿; one of the ghost shells is place on top of the ball at the front tip of the shell, where the ball can still be seen. A clear shell trap is placed over the shell with the ball. The ball can still be seen with the shell resting on top of it. All is moved over to the player. Moving the shell trapped ball over to the player is very visual and appears to be fair. The player will see the ball go inside the shell when moved to them. They can even move it around on the surface and see the ball moving around inside the shell. The other two shells are picked up, shown empty and at the same time the hands are shown empty. You tell them to place their hand over the trap to hold it down so there is no escape. You tell the player by you just placing your hands over the two other shells and when my two index fingers touch your hand this will move the ball from underneath the shell to another location. There are many ways to milk it from here by trying to talk them into picking another shell besides the one they hold. When they take their hand away from the shell trap to look at the shell, they will see the ball inside the shell and will believe they have won. But when the trap is taken off and the shell is picked up the ball is no longer underneath the shell. It is now trapped inside the hollow shell with a sealed bottom. So they lose, as it was not under the shell, it is trapped inside the shell. Everything can be fully examined. This is only an example to help understand the mechanics of some of the things this set can do. This set is open to what your imagination wants to bring to your routine. This set can play well as an extended routine off a regular shell routine with the idea of maybe this set could be easier for you to follow. The Black Walnut Bottom Ridge Shell molds were made from a real black walnut shell, from the inside and out. No added putty inside of the shell. This brings a natural look and more head space for the pea to roll freely. 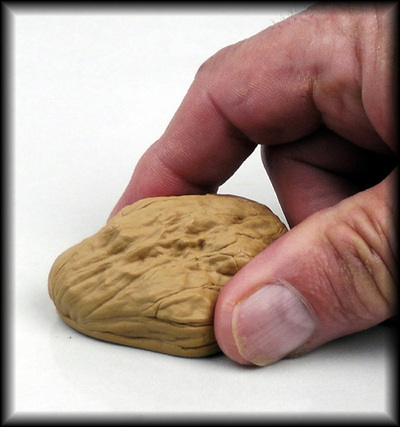 The outside rough texture of the black walnut shell is one of the best type shells for easy handling. Any area of the shell brings a sure easy grip for better control of the shells. The size of the black walnut shell is 1-3/8" diameter round. This round type shell brings many features being used with the new 21th-century bottom ridge design. 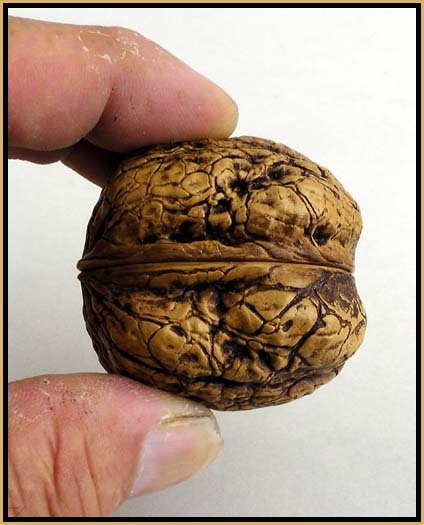 The bottom ridge on the shell bottom is just like what is on a real black walnut. This ridge bottom is shaped to keep the pea in the shell when moved in all directions. This is NOT a gimmick! The bottom ridge is just the opposite of being a gimmick, as it makes it a fair shell to appear as a fair game. This ridge never hides or holds the pea inside the shell when the shell is lifted up off the surface. This means you can bring the confidence for the player to think they have a chance to win. Everything can be fully examined at any time if need be without switching anything out. Also these type shells are the only shells that actually have a secret in the stealing of the pea. You are never forced to take the pea. You have full control when you steal or load a pea. The shells have no clues, rules and nothing to hide. The only unfair thing is the shell operator that can play fair to sell the con and at anytime play unfair for the win. Amazing surprises: The barrel pea holder is just the right size to fit standing up inside the shell. For a surprise, the pea is put in the barrel and shaken to show it does not come out. The barrel is placed mouth down on the surface. A shell is placed over the barrel with the pea and the shell is moved over to the player to place their finger on top of it, so nothing can get in or out. The other two shells are pick up and shown to be empty and at the same time both hands are seen to be empty. When the player lifts up everything one by one, the pea is not in the barrel. The pea can turn up in another shell or anywhere you want it too. There are many other ways, this is just one idea that could be used. Comes with video instructions on the handling of the bottom ridge shells, pea loading, and stealing. The Black Walnut Shell molds were made from a real black walnut shell, from the inside and out. No added putty inside of the shell. This brings a natural look and more head space for the pea to roll freely. 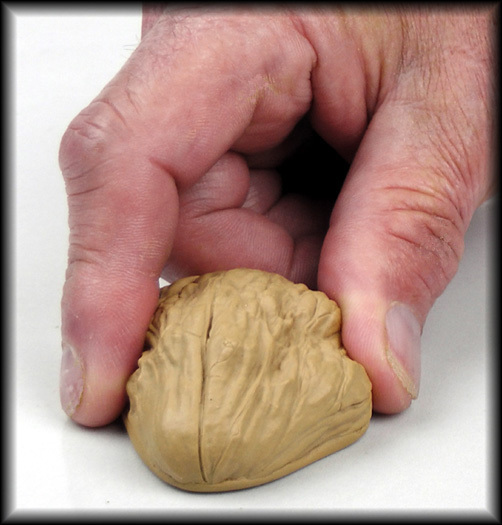 The outside rough texture of the black walnut shell is one of the best type shells for easy handling. Any area of the shell brings a sure easy grip for better control of the shells. The set comes with four 3/8" KDS - soft peas with pea holders. These are one of the best working peas you will find. The softness of the pea will actually take form between the fingers when finger clipping them. The steal and loading of the pea to and from the shell will all happen very smoothly, even with entire flat surface. No notch or Channin dip shell gimmicks needed. The Colossal shell is larger in every direction than other shells on the market to enhance your shell game display. The glove fit grip on the shell makes them easy to handle no matter what size hands you have. They come in two type styles. The classic type shell or the Bottom Ridge type. Both come with the 7/16" Peas. The shells can use up too a 5/8" pea if you want, as it has lots of inside head space. The KDS type peas that come with the set are some of softest peas on the market. These peas are the easiest peas to handle and finger clip you can find. Big shells that work for all size hands! The shells without the clues & rulers. With nothing to hide! This is a high-quality set of shells made for the professional magician. The molds were made from a real walnut shell. The walnuts come from a rare tree that produces giant walnuts and only one of these trees exist today. The shape, size and texture of the shell were carefully selected for many reasons before the molds were made. This will all prove out as soon as you handle them. Every once in a while Mother Nature will surprise us with something special. I was very fortunate to come across it and made it work for something special. 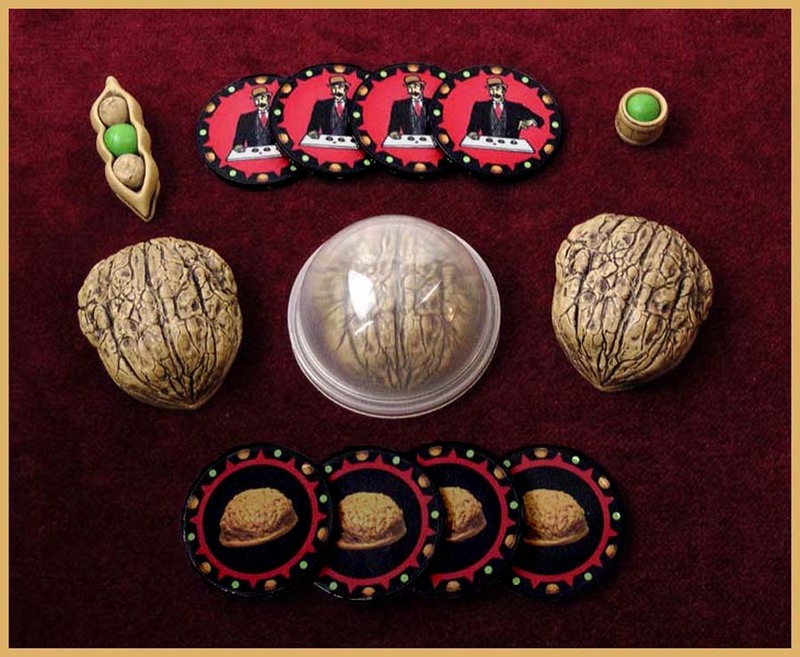 This marvelous large rim walnut shell has a unique shape that will make the handling of the shells a breeze with the 3 shell game. This is a rare find. Because the bottom ridge makes it a fair game till you make it unfair. A con game is not a con game till the player has the confidence to play. With the bottom ridge shells, there are no clues or rules and nothing to hide that brings confidence to play. Everything can even be fully examined if need be. No switching of the soft pea out. The soft pea has a reason for being soft, so they don't hear which shell it is in, by the sound. Unlike other shells, the ridge keeps the pea in the shells when moved in all direction, to make it a fair game. 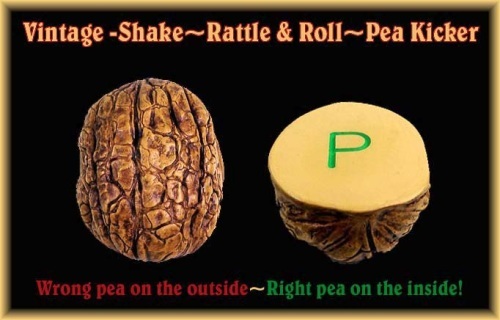 This can bring the confidence to follow the correct shell that has the pea by lifting shells during the shuffle, to show the pea or the shells that don't have the pea. This not only gets them to follow the shell you want them to follow, but cuts the steal and loading of the pea down to one time without having to hide the pea in the hand. This cuts down any chances of them seeing it, as you can pick the right time to execute everything. Peas - The peas are the best handling peas you will find. They are much softer than others, this makes them easier to control and finger clip. Work on hard or soft surfaces. This is why the set comes with large 7/16" & 1/2" peas, because even the larger sizes are easy to work with. 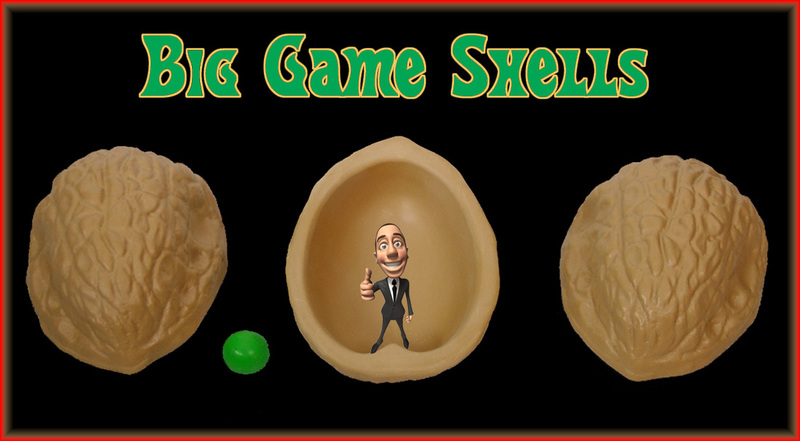 The Big Game Shells are a set of walnut shells that will show well for the bigger crowds. Big, but are still easy to handle. They are 4- 1/4" long, by 3- 1/2" wide, 1- 3/4" high and weight is about 4-1/4 ounces per shell. The shells work with a 5/8" soft pea. The peas that come with the set are the KDS -Peas. These peas are much softer than most other peas. They can work on a hard or soft surface and the peas are easy to finger clip. The shells do not require much space to operate and show well. The shells work like the standard type shells, but without all the visual clue alterations. Has an entire flat natural surface with an inward stem point to look more natural looking and still handle with ease. No magnets are needed in handling these shells. Lots of inside head space to deliver a surprise load. The shells are very solid, will last you a life time. High Quality! Work on hard or soft surface. The shells do not require much space to operate and show well. The right size jumbo shells that gives you the ability to perform in more situations. Can work with or without the use of a magnet, depending on the type pea used. You will be able to create routines that have never been displayed before! These little smiling peanuts will bring fun smiles to anyone. They pack small with big features. This set can go way beyond any shell set on the market today and is all done without any gimmicks. Everything can be fully examined at any time, without switching anything out. You have full control with no clues, rules or anything to hide. The player can actually think they have a fair chance to win! As the shells with the cork ball can be displayed giving prove that the cork ball has no escape when shuffling the shells around on the surface. They can even shuffle them around themselves, to see they are fair shells without any gimmicks. You first sell the con, then at any time you choose you can change it to an unfair game to always win. It is never a con game unless you can make them believe they do have a fair chance to win! All the soft pea shells on the market today cannot bring this. These type shells need a crew of shill's to bring the con. As the shells on their own cannot bring the con of having a fair chance to win. Our Cork Ball & Bottom Ridge Shells are the only shells that do have a secret to how they work. As all other shells cannot be fully examined unless something is switched in and out. Even then it can be detected. These type shells are 21st-century type shells that can be displayed like a magician. Not by magic, as a magician displaying good sleight of hand skills. All the shells sets on this site were design for this purpose, to prove you do have skills and are not done by gimmicks. * Entire flat bottom shell surface where the cork ball will stay inside the shell to sell the fair game con. 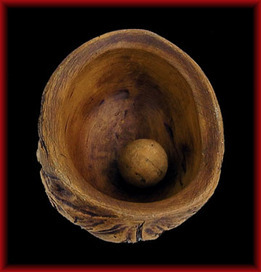 * A cork ball being used will bring the display of the shell game how it was original played. * Have full control. Never force to take the ball. No one can predict when you do a steal or load. * Can be fully examined at any time to sell the con. As there are no clues, rules or anything to hide. * Easy to carry with you everything fits in a small 3" bag. * High-quality cold cast bronze shells with stainless steel cork ball carry cylinder. You can display many type routines. The set comes with 5/16" cork balls but can also work with the soft type ball like used with other type shells. If used with the soft type ball you lose the fair shell con display as the softball will come out of the shell whenever the shell is moved with the ball. When the shells are used with the softball they work like the standard type shells used today. You are able to build your routine anyway you choose. The con game, a magical routine or a little of both. There are many ways to bring some ending surprises with this set. Here is an example. 1) A real peanut can be secretly wedged in the shell. 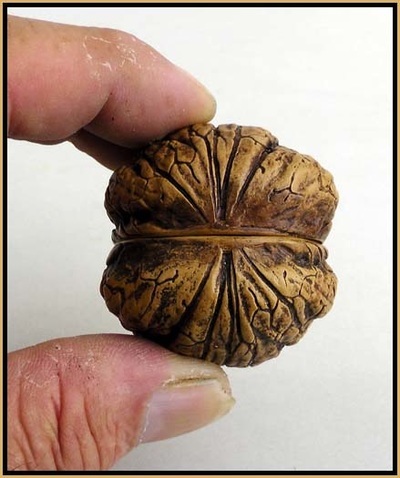 The shell will appear to be a empty shell when the shell is held up off the surface to place the shell over the ball that is stolen and when the shell is lifted a real peanut is in its place. The ball can reappear wherever you like. Shells high pressure cold cast bronze castings. Weight 7 grams per - 1-9/16” long by 7/16” wide and 1/2” high.